With my recipes, it’s all about insulin. That’s my justification for using erythritol, xylitol, and even artificial sweeteners once in a blue moon at Starbucks. Not everyone agrees with this approach, and that is okay! That’s what so wonderful about the blogosphere–there are recipes for all dietary plans. Just do your research before accepting “natural” sweeteners automatically as the best optional for your healthy eating plan. Disclaimer: I’m not any sort of healthcare professional–just a student and an avid reader. To take an in depth look at one expert’s opinion concerning the latest nutrition research, information, check out Good Calories, Bad Calories: Fats, Carbs, and the Controversial Science of Diet and Health by Gary Taubes. He’s been making waves recently with his thought-provoking analysis. And finally, the recipe! It’s a moist, tender cake, with a loose crumb. You could definitely amp up the coconut flavor with coconut extract used for half of the vanilla. Bake it into a layer for a coconut layer cake! My cream cheese frosting flavored with a bit of coconut extract would be perfect for it. With a Magic Bullet or food processor, grind shredded coconut into a fine, powdery meal. Scoop almond flour into measuring cup, and pack it in firmly with your hands, like you’re measuring brown sugar. Sweep it level. Add to coconut and the rest of the dry ingredients. Melt butter, and beat in eggs, vanilla extract, and coconut milk. Add dry ingredients into wet ingredients, and beat together for a couple of minutes. Line a mini muffin pan with mini muffin papers, and spray with extra virgin olive oil spray. Alternatively, grease mini muffin wells very well with coconut oil. Pour batter almost to the top of mini muffin cups. Rap muffin tin gently on the counter to pop air bubbles. Bake for 18-20 minutes, until springy and firm to the touch. You might have to bake these longer since my oven in this apartment runs hot. 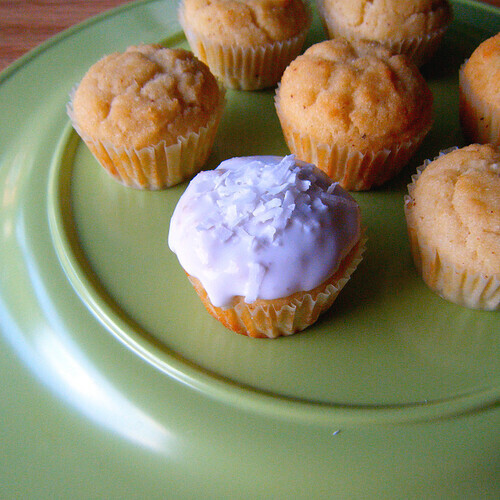 Remove cakes from muffin tins as soon as they are cool to the touch, and cool on a wire rack. Dip cakes into glaze. Serve at room temperature. Whisk together coconut milk, and sift in coconut flour. Whisk in coconut flour until no lumps remain, then add a pinch of salt, and sweeteners. Taste and adjust sweetness level if necessary. Dip cakes into glaze and sprinkle with unsweetened coconut. These are soo cute! I especially like the "frosting" you created- I will definitely be trying that soon! My chin hit my chest when I got the the carb count. I stumbled upon your blog & just wanted to say that your sweets & images are fantastic. I saw the title and thought I wouldn't be able to try these. Coconut flour hard to get in the UK unless you pay a fortune for it. So I was delighted to see it wasn't the flour you used. Will definitely be trying these after the success of the chocolate bean cake!! Sounds So good! Can`t wait to make my own.Thank You for the descrption and preparation about the healthy coconut cake bites.Healthy Recipesfor all. THOSE ARE SO CUTE!!!! 😉 You go with your creative self Lauren!! 😉 YUM! OMG! These are amazing. I'm so excited to try these and offer them up as healthy treats. Will try these and I'm thinking these would be perfect for my clients who can't have sugar or carbs. LOVE your blog! Coconut on coconut! I love seeing what you come up with, the only thing that's missing is a napkin for me to wipe my mouth with after I devour these amazing treats like a crazy lady. You need to open up a bakery! I LOVE that you mixed coconut flour, coconut milk and almond flour! I feel like it's my kitchen but that glaze is different and looks delicious and I'm definitely going to make that and put it in the fridge for craving time. Yum! Hey, great blog. Curious, where did you read that Taubes is coming out with a condensed version of GCBC? I've been wanting to read it but it's just so long and probably goes too in depth for what I am interested in. Thanks. Those are simply beautiful! I was just saying to my husband that I needed to make some mini muffins for my daughter. Thanks for the inspiration! By the way, you had mentioned in a comment on my blog that my blog updates aren't showing on your sidebar. It looks like it got stuck when I moved over from blogspot to wordpress. Maybe try taking me out, and then adding me back in (and hopefully it will add me back in as a wordpress blog, instead of blogspot). See if that helps. Thanks for asking! What a lovely recipe! I LOVE coconut flour treats. I don't feel quite as guilty giving them to my little guy. Hey Lo, Ive been giving your site out to patients at the hospital! Just to get your food out in the open! Very good points!! I'm with you… am still not decided on the agave vs honey point myself.. agave is fructose, yet it doesn't affect insulin somehow. Hmm. Still can't decide. At least they are interchangeable so everyone can make their own mind up about them! I'm so glad to hear that Taubes is writing a book that is for the masses. I love, Good Calories, Bad Calories for the info, but it is seriously challenging to read through. Thanks Lauren! I just love your blog!! I needed a recipe to send along with my daughter for a birthday party she's attending this weekend. I'll be making these tonight. I'll let you know how it goes. Looking forward to the little muffins! Lauren, your recipe is wonderful! I just made a double batch. Everyone loved them. I thought they would be dry, but they were moist and dense and delicious. Thank you!! Meagan – Hope you give these a shot! Aurelia – Haha, they are very low carb! Jackie – So glad you'll be able to try these where you are, across the pond! Glad you like the bean cake. Carrie – Thank you so much! CaSaundraLeigh – Glad you found the blog! Thanks for your sweet comment. Paige – I hope you get to try these and share them with your clients! Sophie – Your comment made me laugh! A bakery someday would be amazing. Jason – I don't remember right now, but I'll let you know when I track down my source for that information! Thanks for stopping by. Kimi – I hope you get to try these for your daughter! Thanks for the advice regarding the side bar. Jenny – I hope you get to try these for your little guy! Vanessa – I love you! Thanks for stopping by, girl. And for sharing the blog with the patients at the hospital! Rachel – I'm glad about Taubes book too! Will definitely keep coming up with alternatives to almond. It's just too expensive to experiment with! Agave is metabolized by the liver. That's why it doesn't affect your insulin! Tara – Thanks so much for the WAPF article. So glad these cupcakes worked out for you! Lauren, I made these yesterday and they are super good! Light and fluffy. My coconut milk glaze was kinda runny (I used a thinner brand of coconut milk than I usually do, so I'll blame it on that), so instead of glazing all the cupcakes ahead of time I am just keeping the glaze in a little tupperware and we dunk our cupcakes into it like fondue. Mmm. Love, love, love these! Made a half batch Sunday and ate the last two today (Wed)! The half batch made 12 large mini-muffins. I messed up the glaze by adding too much sweetener but loved them "naked." 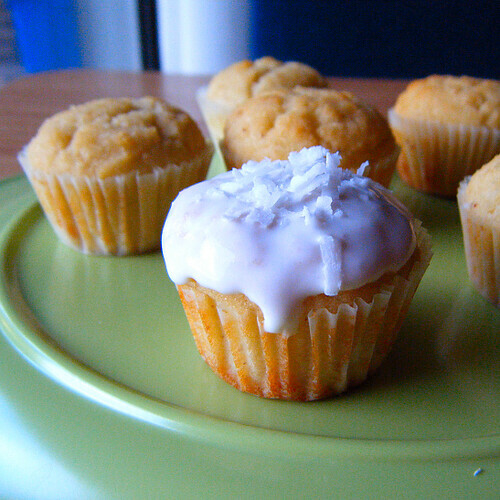 I can't wait to get to the store and get more coconut to make these again! Thanks so much for many great recipes! Holy cow, these are good! The kids and I had them for breakfast this morning! My glaze was also a bit runny, but the muffins themselves are perfect. Maybe next time I'll try the Xanthum gum. First black bean cake, now these – low carb is going to be easier than I thought! Elizabeth – Cupcake fondue–sounds fabulous! Hmm, I am not sure why the frosting was runnier. Perhaps I packed down the coconut flour in my measuring spoon. Glad you ended up enjoying them! Bonnie – Thanks for sharing your feedback with these! Good to know they're fine without the glaze. Shari – Bet they were lovely with strawberries! Glad they turned out well for you. These mini cupcakes are delicious! I have avoided all grain products for about a year but have not been happy with any of the baked treats I have tried. I mainly use almond flour to bake, so the coconut flour was a nice surprise. The coconut cake bites were moist and tender. I made a variation of your cream cheese recipe sweetened with honey and thinned with a little of the coconut milk. Absolutely fantastic! Thank you so much for sharing the recipe. I look forward to trying more of your baked goodies! Hi! Have been wanting to try this recipe for a long time and today was the day I got it accomplished. I loved them! Very yummy! My kids loved them too! Thank you for the great recipe! Laura, where can I make a monitory contribution to your site. You are definitely "da bomb!" Pegbord, thank you SO much for that nice comment! I create a yellow PayPal "DONATE" button and placed it on the sidebar (to the left) of my blog content). 🙂 What a nice offer! I made these today and they are YUMMY! I had a couple of questions, though. My "batter" wasn't really batter. It was more like a wet crumbly consistency. I checked and double-checked all my amounts and they were correct. They also didn't rise much if at all. The flavor is great, but not really the consistency of yours. The only thing I can think of is that I ground my own almonds and my food processor couldn't really get it as fine as flour. I'd say it was more like a "meal". Thoughts? I'm attempting to make these this morning but after I got all the ingredients mixed up it is still the consistency of the flour, just a tad crumblier (is that a word?). Instead of grinding up the coconut, I used 2 cups of coconut flour that I had on hand. How wet should the batter be and if I use coconut flour how much should I have used? 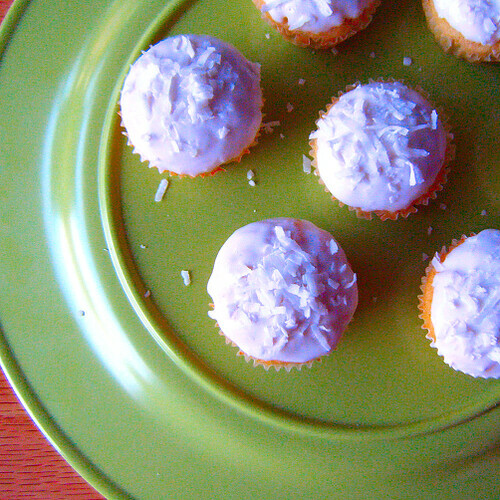 I made these yesterday, and this is now my "go to" recipe for coconut – even more so than your coconut pound cake! It also uses less coconut flour, eggs, and butter, so you also save money by making these – yet still get the coconut cake taste I've been looking for. Thank you so much for creating this, Lauren! I posted about this to my weight loss surgery friends over at rf06.com. Hi T2Nashville! So glad you enjoyed these coconut cake bites. They are a pretty sweet deal! 🙂 Congrats on the weight loss. I made these the other day and they are DELISH! They also keep very well, they were just as good if not better a week after, as they were the first day. Thanks Lauren, I just LOVE your recipes! I would think that if you're short on shredded coconut, it would be more viable to substitute it with a nut meal like almond flour (almonds ground in food processor) but I haven't tried this, so I'm not positive! Casey, I am glad you got something you enjoyed from the recipe, whether it was intentional or not. 😀 Sounds like a happy accident! Anon – If you follow the recipe exactly, without making substitutions, you should get great results. 🙂 Sorry I can't be more helpful with substitution questions. I made the Healthy Coconut Cake Bites and they were oh sooo yummy. My whole family liked them and they will be a definate item I make again thank you for the great recipes. Thank you, Thank you SO much for your blog!!! We are gluten free- and the gf flours are all SO HIGH CARB!! This is a AWESOME site for diabetics also! these look and sound so delicious, thanks for sharing! I finally was able to make these cup cakes and boy are they delicious. My daughter loved them too. Hi Lauren! Yes please post more recipes using beans…I made a spice cake even using chick peas too and it was great. I would love more ideas in the bean department. They are way cheaper than almond flour. 🙂 Thanks! Could you use oat flour instead of almond flour? Anon – I don't think oat flour would work here. Try it and let me know what you think! I like to eat these warm with butter without the glaze. Very tasty! I just started the Atkins Diet and I can't wait until I'll be able to eat these! All of your recipes look so good. Knowing I have amazing looking treats like these to look forward to make sticking to the diet easier. Thank you for sharing! These all sound like winners to me! Keep up the good work! Just made these yesterday- trying to find low carb recipes for my recently diagnosed Type 1 diabetic 14 yr old son, and now that we know all about how insulin and carbs work, for the rest of the family! These are awesome and we made the glaze to dip them in too! I didn’t have coconut flour, but did have rice flour and used that. Didn’t have stevia extract and just skipped it. I’ll use some coconut extract next time to make them taste even better! I made 24 cupcakes and cooked them for 25 minutes. 1 pkt stevia powder (2 gram size) for the glaze- just right! Will make again and try more of your recipes- THANK YOU!!! So glad you enjoyed these, Cairie! If any other Diabetics make this recipe…it is better for you to make as directed. Someone else said they used Rice Flour and that is too high in Carbohydrates for a Diabetic and will raise insulin levels. Rhonda, thanks for sharing your feedback! I agree with you about rice flour. Probably not the best idea, but of course it depends on the diabetic eating plan you are following. I am a Registered Nurse with 25 years of experience in Health Care and have done teaching for Diabetics. Love your Recipe and just want everyone to maintain their health as you do. The diet is the same for ALL Diabetics whether you are Type 1 or Type 2. It is Low Carb and Rice flour is full of carbs and will raise blood sugar levels. Much better to use Almond or Coconut flour in all Recipes as they have a lower Glycemic Index and your first choice was the best. The protein powder you mentioned is also a great substitute! Thanks for the wonderful Recipes! Rhonda, thanks for your recommendations below re: diabetic-friendly eating! So glad to hear you are enjoying the recipes. There are more coming your way this fall! If you haven’t seen the new recipes index, please click on the “Recipes” tab. There you’ll find a complete list of the recipes on the blog, by category. Hi Lauren! Do you keep the nutrition facts on these AWESOME cupcakes. They were amazing but I’m on WeightWatchers and I want to know howuch points they are. Thanks so much!!!! !